Each of us has a responsibility to look out for friends, family and acquaintances for any signs or suspicions of self-harm and to offer help and support during whatever is compelling someone to hurt themselves. If you have a friend, loved one or acquaintance who is self-injuring or has revealed thoughts about self- harm, you must take it seriously. You may feel shocked, scared, or even feel you’re betraying their privacy. However, this is too big of a problem to ignore, and their safety and well-being are the most important considerations. If you know anyone injuring themselves, suggest they reach out to someone they trust, such as their parents, friends, teachers, a counselor, a physician or spiritual leader. Furthermore, always keep the suicide hotline number close by: 1-800-273-TALK (1-800-273-8255). If you find yourself in an emergency situation, this requires a quicker but, most importantly, calm response by calling 911 or other local emergency numbers. Do not condemn or criticize anyone who has cut themselves for their behavior. What they need most is support and healthy coping skills rather than added negativity. 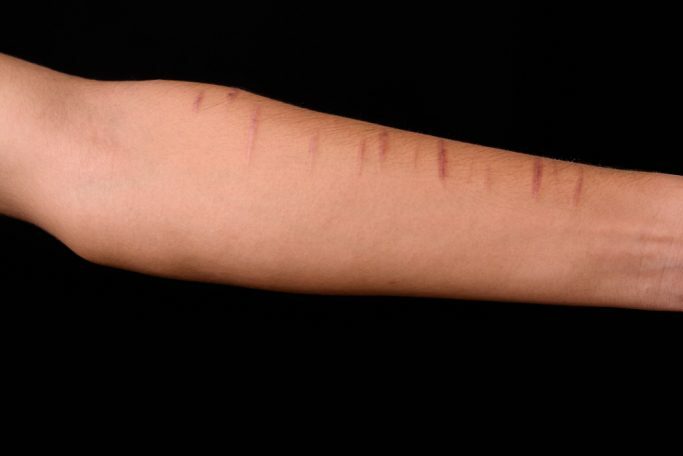 Preventing self-harm should be the utmost goal. There’s no fool-proof way to do so, but there are various avenues that can be taken to curtail it, including many seemingly small things anybody can do to look out for others and make a real difference. Help is available If you have ever harmed or currently harm yourself in any way, or if you’ve had suicidal thoughts, remember one thing: You can overcome almost any challenge. If you have injured yourself and believe your injury is life-threatening in any way, immediately call 911 or the suicide hotline. Most importantly, reach out to somebody, anybody. If you can’t talk to your family members, talk to your doctor. If the doctor is not available, there is always help available at the hospital’s emergency room. Be it family, friend, minister or doctor, there is always someone there to help you. Please reach out.